Well, it's been a while since I've done a more personal blog entry, but today seems like a fun time to do one. I guess blogging should capture all emotions, not just "hey, here's a review of Teen Titans" or a He-Man review or two. Not that I don't enjoy those, but I feel like my blog could use a dash of my real life here and there. Now, today's entry isn't exactly a sappy entry, it's more of one of complete joy. But I'm sure so many others will share the feelings that I expound upon. When I was about 6, my father passed away. While for many, that would stop a child's innocence and sense of wonder would vanish in the blink of an eye, my mother made sure my childhood and childlike innocence stayed intact. Which probably explains a lot on this site and my personality. A lot of stuff from that time period really stuck with me and I never gave up on my interests or hobbies. It's a probably good thing or it's just plain stubbornness. At the same time, my mom always taught me to never apologize for the things I liked. Whether it was a fad that I had interest in or a show that nobody else watched, I clung to the things I loved! Which is why when you see me arguing on social media over why Nightmare on Elm Street 5 is my favorite of the series or why at age 10, when X-Men was super popular, I was still playing with GI Joe and He-Man. It's just always been who I am. My brother, wasn't as lucky. He had fallen into bad habits, bad decisions and a very bad crowd and became pretty aggravating to be around. You'll see why I mention that in a moment. So that leads to one of my favorite shows as a child. Pee Wee's Playhouse. Oh my gosh, there was no other tv show on Saturday morning (or prime-time) quite like it. A show where every ridiculous idea or character that could be imagined, became reality. 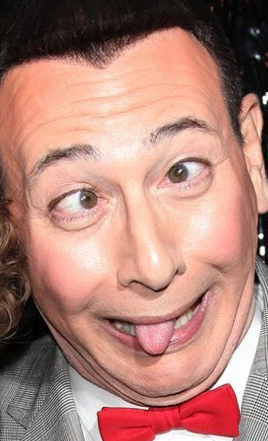 Paul Reubens was an innovator in children's television and his character Pee-Wee was something all kids could relate too. A big kid who could live in his own fantasy world where everyone loves him? He was never mean to anyone, he wanted to be everyones friend! Who didn't want to be a part of that world? So while I adored PeeWee, my brother hated him, which lead to a hilarious moment at a family meeting when my brother threw his fist down and screamed "ALLRIGHT, NO MORE PEEWEE'S PLAYHOUSE!" to which I shouted something back about him not watching MTV because I thought at age 7 I could be big and bad too and it turned into the dumbest argument you'll ever hear. I'm sure my poor mom just wanted to discuss who needed to take the trash out or something that most likely did not deserve a family meeting. 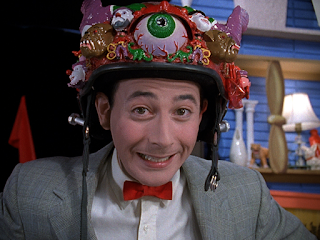 Obviously my household grew up loving PeeWee's Big Adventure, and helped sow the seeds of over the top, silly, slapstick humor that I'd grow to love and adapt as my own brand of humor. Everything in that movie just made me laugh. Well, except the scene in Frances' bathtub. Call me crazy but the scene where they show PeeWee's feet stepping into the pool, freaked me out as a child and everytime I jumped in a pool and looked under the water, I'd always look for feet. Not even Large Marge freaked me out as bad! Then again, I was like 3 or 4, so minor crap stuff would shake me up. Be that as it may, I grew up a goofy child and an even goofier adult and PeeWee helped trigger that. So obviously, we all know what happened to Paul in the early 90s. As a kid, I didn't understand why he was being ostracized or made fun of but it just astounded me that people who loved him a year before were hopping on the "make fun of PeeWee" train. It was my first exposure to just how cruel society could be to a celebrity. Not me though. Even as I grew up, I still loved him and looked forward to his appearances in movies and tv shows. And as I grew older, I loved him even more for different reasons. In 2003, I started working with children and I found that I was just not connecting or even doing a very good job in general. But I mean, what do you expect? I was right out of high school and knew nothing of how the real world works. When it came to working with children, I've never been that good at being a boss or even solid authority figure but I knew I was good at being someone the kids could trust and be that person who could possibly be a role model. But at age 19? Man, I still had some maturing to do myself. I had a lot of learning and growing up to do before I could be a role model. So one day, I was searching for some old PeeWee Herman stuff online when I ran across and interview he did in the late 80s about his role in pop culture and the importance of the impact he had on children. I read it and really opened my eyes. Especially one line in particular. "I want to encourage children to never stop asking questions.". Essentially saying, listen to them and help them learn and grow. Talk about a real game changer. This whole time, I've been telling kids what do and not letting them ask me anything or even asking them questions. And then it came back to when I was a kid. PeeWee taught nothing but joy and love and acceptance of all religions, races, genders, and everything in between and I never noticed til I started reading this interview. If PeeWee encouraged me to be proud of my weirdness and never apologize for being an individual who stands on his own, why shouldn't I encourage the next generation to do so? It all made sense as to why the show had such a positive influence on me and others. Needless to say, after thinking about that quote from Paul, things changed for me. I loosened up, I became a little bit more of a relaxed, not just at work but I started seeing it in my personal life too, I still remained sarcastic and silly but I was more open to listening to what the children had to say. It was a different mindset than what I went in with and it paid off. For 13 years, I worked with children and was very proud of being a role model and someone kids could relate to as well as someone they could confide in. In turn, they taught me a lot about me and where my priorities lie. I got to watch a lot of kids grow up and I too grew up a lot as well. I accomplished everything I could in that time and after lucky year number 13, I moved on. But my memories of working with kids and the impact they had on me, will last forever. And that's in part to Pee-Wee Herman himself. So when it was announced today, around noon, that Paul Reubens would be a guest at the upcoming Monster Mania in Cherry Hill, NJ, a show I'm quite familiar with, I went through the roof. I actually leapt in the air with joy. I'll be able to tell Paul about the influence he had on me, as well as thank him. I'm sure he hears stories of his influence all the time, but I'll be happy to share mine as well. I'm looking forward to hanging out with my friends who I only see once a year, but to thank someone who had such a huge influence on me over the course of my life? That's definitely worth more than the price of admission alone.